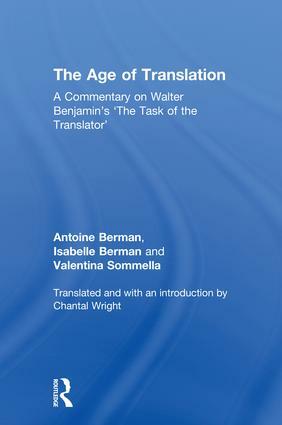 The Age of Translation is the first English translation of Antoine Berman’s commentary on Walter Benjamin’s seminal essay ‘The Task of the Translator’. Chantal Wright’s translation includes an introduction which positions the text in relation to current developments in translation studies, and provides prefatory explanations before each section as a guide to Walter Benjamin’s ideas. These include influential concepts such as the ‘afterlife’ of literary works, the ‘kinship’ of languages, and the metaphysical notion of ‘pure language’. The Age of Translation is a vital read for students and scholars in the fields of translation studies, literary studies, cultural studies and philosophy. Chantal Wright is Associate Professor at the University of Warwick. She is the author of Literary Translation (Routledge, 2016).